SABRE Home Security Reviews: Can SABRE Keep You Safe? SABRE Home Security Reviews: Can SABRE Home Security Equipment Keep You Safe? SABRE is known primarily for its pepper spray, but the company also offers a number of home security products geared toward people who don’t want to pay for an expensive monitored system. A Secure Life strongly recommends investing in a monitored home security system because they provide much more protection than you could ever get from something you have to monitor on your own. An unmonitored system won’t record any footage of criminals or alert the authorities to an incident at your home. If you aren’t there to hear the alarm, there’s not much you can do. However, since a monitored system isn’t an option for everyone, we’re glad there are alternatives out there that can still improve your safety. SABRE home security products could be a good alternative to a monitored system for people on an extremely tight budget. Keep reading for our full review of SABRE home security. SABRE customers can choose between the wireless home security system and the simpler standalone home alarms. The wireless system is a bit more advanced and is a good option if you want your security devices to work together. 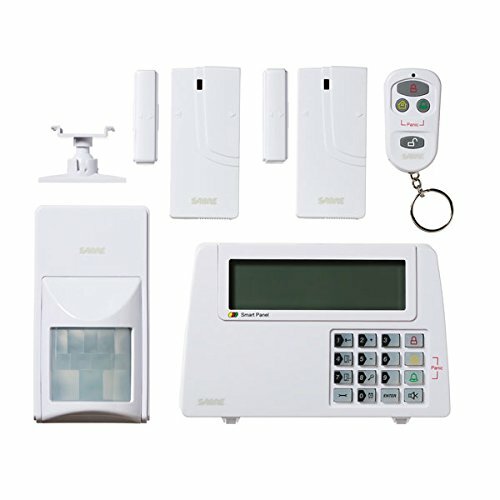 The standalone alarms are less expensive and don’t have to be connected to a hub, so they’re a good option if you want to spend less on some basic security. If you choose the wireless home security system, you’ll get a set of security devices that can be synced and controlled together. SABRE makes it pretty easy to customize your setup, but you’ll need to start with the wireless home alarm system kit. This equipment and the other optional accessories can all be connected through the same system. If one of the sensors in this system is triggered, the siren on the LCD display will go off. This siren is loud—120 decibels—and it is audible for 750 feet. For context, a jet plane taking off is also 120 dB, while loud household appliances like blow dryers and food processors are 80–90 dB. You probably don’t need to worry about sleeping through the alarm if it goes off. Once you have the base kit, you can add the following items to your setup. Door/window sensor: Your kit will come with two sensors, but if you want to secure more of the entrances to your home, you can purchase extra sensors individually or in packs. Motion sensor: You’ll get one motion sensor in the kit, but if you’d like to add more to other areas of your house, you can purchase them individually. It has a 120-degree angle of detection and can be placed up to 500 feet from the main control panel. Home alarm siren: While the alarm on the primary display unit is quite loud, you have the option to connect extra home alarm sirens that are audible up to 300 feet away and rated at 100 dB. Wireless keypad control: This keypad can’t replace the main display, but it can be used as an extra control in the garage or another area of your home. SABRE offers a variety of standalone alarms that can be used throughout your home. Unlike the wireless system, these alarms don’t connect to each other, and they can’t be controlled through a hub. These alarms are less convenient than the wireless alarms that all sync up, but they are also more affordable. All the items in this kit can be purchased on their own, but purchasing them together means you’ll get a discounted price. 1 doorstop alarm: This alarm is shaped like a normal wedge doorstop. It will sound a 120 dB siren if pressure is applied, so if it is placed under a door, it will go off if someone tries to open it. This siren is audible for up to 1,000 feet. 1 door or window alarm: This alarm has magnetic sensors and can be installed quickly with self-adhesives. It has a 120 dB siren, but it can also be switched to chime mode. Keychain alarm: This alarm has a 110 dB siren. It is activated by pulling the metal chain. 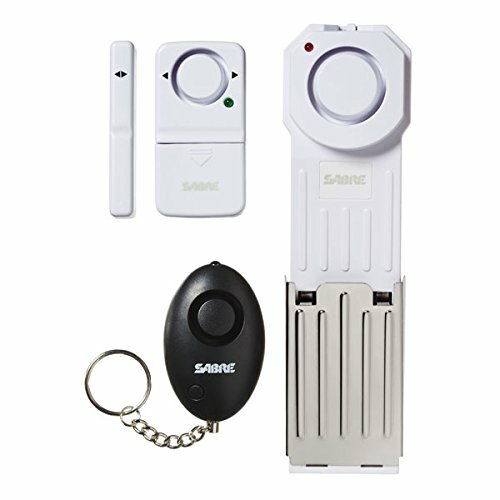 SABRE’s Elite Door Alarm can provide some rudimentary home security if you’re looking for something that comes with an entry code. 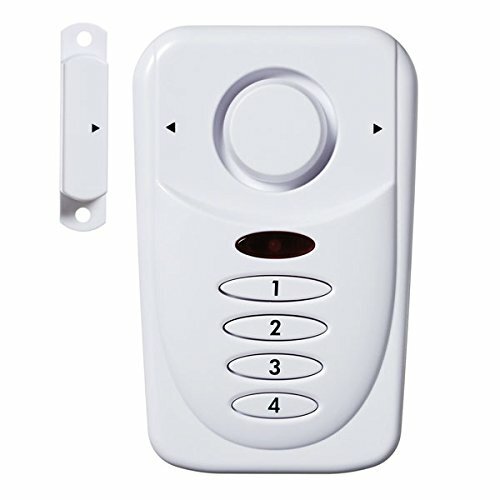 This alarm can be programmed with a PIN, so it would be useful if you wanted to let a family member or friend enter your house while you’re away. The alarm is easy to install wherever you need it because it is wireless and the sensor can be mounted on either side of alarm. *Note: This is also sold as the Shed and Garage Alarm, but it is the same piece of equipment. We take home security very seriously, so we’re pretty strict when evaluating home security systems, companies, and equipment. While we’ve been relatively critical of SABRE’s limited protection, there are things we like about the company. Customizability: SABRE lets you create a custom system that suits your unique needs. Affordability: Equipment is incredibly inexpensive—almost anyone could afford a few sensors and alarms. Usability: SABRE equipment is easy to use and easy to install. Most alarms and sensors are battery powered, so you don’t have to wire anything. Plus, many of the sensors and alarms can be installed without any tools. Is SABRE Home Security right for you? Frankly, we’re hesitant to recommend SABRE to anyone who is serious about home security. SABRE does what it sets out to do, which is provide affordable, easy-to-use security equipment. But since SABRE has no monitoring or mobile access, and because a lot of its equipment is just for show (fake security cameras and TV lights), we still don’t feel like SABRE is a reliable home security option. If your budget won’t allow for a full, professionally monitored system, SABRE’s alarms are certainly better than taking no security precautions at all. The alarms and sensors are inexpensive, so they might be the right choice for college students or other renters on an extremely tight budget. In most cases, however, we recommend investing in something that offers more protection. So, what should you get instead? Frontpoint is our top-rated home security system provider, and if you’re looking for the best protection for your home, we strongly advise investing in a monitored system from Frontpoint. You get state-of-the-art equipment, reliable monitoring, and incredibly supportive customer service. Are you looking for a system that you can monitor on your own? If you opt out of a monitored system, we’d suggest our highest-ranking security system without monitoring: Piper. Piper equipment is more expensive than SABRE’s, but it is stylish and capable—and you don’t have to pay any monthly cost after you’ve invested in the equipment. Most importantly, Piper has a high-quality camera with motion detection and two-way audio. While it isn’t as good as a monitored system, the camera can still record an incident so that you can share footage with authorities. In addition to the camera and security sensors, Piper offers lightbulbs that can be connected to your system and a smart switch that lets you control home appliances while you’re away and schedule when they’re on and off. If you don’t want to pay for monthly monitoring but you’re willing to invest in high-quality equipment, you may want to consider Piper. SimpliSafe’s Starter Package costs about $100 more than SABRE’s wireless alarm kit, but you get a similar set of equipment and a lot more flexibility. If you purchase SimpliSafe equipment without the monitoring service, you won’t be able to check in on your home while you’re away. However, if you’re just looking for a basic set of alarms and sensors, we recommend this SimpliSafe package over the SABRE kit because it comes with the option to add monitoring in the future if you decide you need it. You could even turn monitoring on while you’re away on a trip and then back off when you’re in town. SimpliSafe also gives you the option to add lots of other accessories that SABRE doesn’t offer. For example, you could get a camera, smoke detector, carbon monoxide detector, and freeze sensor. SABRE home security equipment might be right for you if you need a very inexpensive but reliable alarm. If you can afford a bit more upfront investment, however, we suggest going with Frontpoint, Piper, or SimpliSafe. What do you use to keep your home or apartment safe? Share your experiences or advice in the comments below.